The optic tectum not only receives visual input, but like its mammalian homologue, the superior colliculus, it receives input from a variety of sensory modalities. This sensory convergence is important for integrating multiple sensory cues and generating orienting behavior. Moreover, it is known that proper development of multisensory responses requires neural activity. In Xenopus we have developed an an experimental preparation in which we can independently activate different pathways representing different sensory modalities while performing whole-cell recordings or Ca++ imaging in an isolated brain. This allows us to study the neural mechanisms underlying multisensory integration at a cellular level during development, as well as test the role of sensory activity in this process. In the long-term, we aim to integrate these single cell-level studies into a behavioral paradigm, which will allow us to directly link cellular events to behavioral output. This is one of the few preparations where the detailed cellular and network-level mechanisms underlying multisensory integration can be studied. Furthermore this preparation will also be useful towards understanding the various types of cross-modal plasticity that occur during development and their underlying mechanisms. Deeg, K.E. and C.D. Aizenman, Sensory modality-specific homeostatic plasticity in the developing optic tectum. Nat Neurosci, 2011. 14(5): p. 548-50. Deeg, K.E., I.B. Sears, and C.D. Aizenman, Development of multisensory convergence in the Xenopus optic tectum. J Neurophysiol, 2009. 102(6): p. 3392-404. Isolated brain preparation for studying multisensory integration. (A) Schematic representation of placement of recording and stimulating electrodes. Principal visual and mechanosensory nerves are represented. 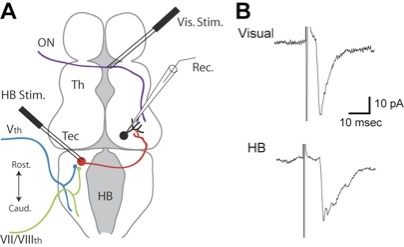 (B) Evoked synaptic responses from visual (V) and mechanosensory (HB) pathways. Modified from Deeg et al. 2009. One of our key goals is to develop experimentally tractable model systems of neurodevelopmental disorders. Our preparation is ideally poised for this, as we can understand how specific genetic or environmental perturbations affect the development of a neural circuit as viewed from multiple levels of analysis, from synapses to circuits to behavior. Our prior work identified a previously unknown role for polyamines in regulating seizure susceptibility as well as the role of pro-inflammatory cytokines in regulating neural circuit formation. Current projects are looking at a VPA-induced model of autism as well as the role of FMRP in neural circuit formation. James EJ, Gu J, Ramirez-Vizcarrondo CM, Hasan M, Truszkowski TL, Tan Y, Oupravanh PM, Khakhalin AS2, Aizenman CD (2015) Valproate-induced neurodevelopmental deficits in Xenopus laevis tadpoles. J. Neurosci. 35(7):3218-29. Bell, Belarde, Johnson and Aizenman (2011), “A neuroprotective role for polyamines in a Xenopus tadpole model of epilepsy.” Nat Neurosci. 2011 Apr;14(4):505-12. Aizenman, Muñoz-Elías, Cline (2002), “Visually driven modulation of glutamatergic synaptic transmission is mediated by the regulation of intracellular polyamines.” Neuron, 34(4):623-34. 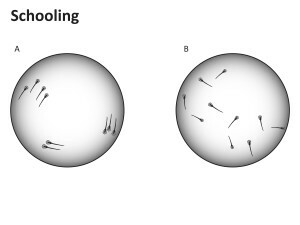 Manipulations such as rearing tadpoles in Valproic Acid, result in abnormal schooling behavior. One of the major challenges faced by the developing visual system is how to stably process visual information, yet at the same time remain flexible enough to accommodate growth and plasticity induced by visual experience. We find that in the Xenopus retinotectal circuit, during a period in development when the retinotectal map undergoes activity-dependent refinement and visual inputs strengthen, tectal neurons adapt their intrinsic excitability such that a stable relationship between the total level of synaptic input and tectal neuron spike output is conserved. This homeostatic balance between synaptic and intrinsic properties is maintained, in part, via regulation of voltage-gated Na+ currents, resulting in a stable neuronal input/output function. This project focuses on the underlying mechanisms involved in these changes in excitability, and explores links between this change and other forms of cellular learning such as synaptic long-term potentiation or depression. The combination of these changes allows cells to stay within an optimum operating range in response to changing environmental conditions, in what has been termed ‘neural homeostasis’. Ciarleglio CM, Khakhalin AS, Wang AF, Constantino AC, Yip SP, Aizenman CD (2015) Multivariate analysis of electrophysiological diversity of Xenopus visual neurons during development and plasticity. eLife 2015;4:e11351. Pratt, KG and Aizenman, CD (2007) Homeostatic regulation of intrinsic excitability and synaptic transmission in a developing visual circuit. J Neurosci. 27 (31):8268-77. Aizenman, Akerman, Jensen and Cline (2003), “Visually driven regulation of intrinsic neuronal excitability improves stimulus detection in vivo. Neuron, 39(5):831-42. Homeostatic regulation of intrinsic and synaptic properties. (A) Summary of changes observed in intrinsic excitability and synaptic transmission during development and after 4 hrs. of visual stimulation. In development excitability decreases as synaptic drive increases, the converse is seen after visual stimulation. 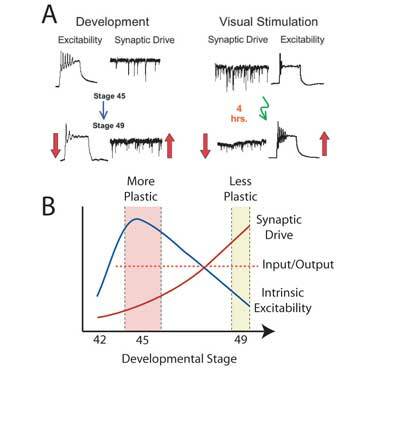 (B) Model describing the expected effects of developmental regulation of synaptic and intrinsic properties. At Stage 45, high intrinsic excitability results in more syanptic plasticity, while at Stage 49, low excitability restricts induction of synaptic plasticity. During both time points functional input-output properties are expected to remain stable. Activity-dependent refinement of the retinotectal projection has been described both anatomically and electrophysiologically. However it remains unclear what the direct consequences of these changes are for visual system function. To what degree do the electrophysiological changes observed during development correlate with changes in visual function? To address this important question, we have developed an integrative approach where we combine whole-cell in vivo and in vitro electrophysiological recordings with behavioral tests designed to elucidate various aspects of visual processing. In this way we can, for example, compare the properties of individual retinotectal synapses and tectal cell receptive field size, with a behavioral test which measures visual acuity. This approach will permit us to understand the relationship between function at individual neurons and the behavior of an intact organism. To see a movie of visual avoidance follow this link. Aspects of this project were carried out through a collaboration with Yoon-Kyu Song and Heng Xu from Arto Nurmikko’s group at the Division of Engineering. Xu, Davitt, Dong, Song, Patterson III, Aizenman and Nurmikko (2008) “Combining Multicore Imaging Fiber With Matrix Addressable Blue/Green LED Arrays for Spatiotemporal Photonic Excitation at Cellular Level” IEEE JSTQE 14(1): 167-70. Dong, Lee, Xu, Yang, Pratt, Cao, Song, Nurmikko and Aizenman. (2009) “Visual Avoidance in Xenopus Tadpoles is Correlated With the Maturation of Visual Responses in the Optic Tectum.” J. Neurophysiology; 101(2):803-15. Neural circuits responsible for mediating response of tadpoles to different visual stimuli. In the retinotectal pathway of Xenopus tadpoles, a tectal neuron’s receptive field (RF) size is determined by both the degree of convergence from different retinal ganglion cells (RGC) as well as by the pattern of excitatory inputs received from neighboring tectal cells. During development, the number of RGCs innervating a tectal neuron decreases via activity-dependent plasticity, reducing RF size. However, it not known how local excitatory feed-forward and recurrent connections in the tectum change during development. Here we look at development and plasticity of recurrent excitatory inputs in the optic tectum at two critical developmental stages (st. 45 and 49), between which RF are known to refine and retinal inputs to strengthen. Liu Z, Ciarleglio CM, Hamodi A, Aizenman CD, Pratt KG (2016) A population of gap junction coupled neurons drives recurrent network activity in a developing visual circuit. J. Neurophysiology in press. Xu, Khakhalin, Nurmikko and Aizenman (2011) “Visual experience-dependent maturation of correlated neuronal activity patterns in a developing visual system.” J Neurosci. 31(22):8025-36. Pratt, Dong and Aizenman (2008) “Development and spike timing-dependent plasticity of recurrent excitation in the Xenopus optic tectum.” Nature Neuroscience, April 2008. 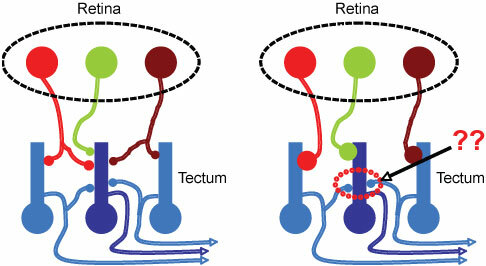 Schematic showing possible consequences of refinemnt of retinotectal inputs vs. intra-tectal circuitry.